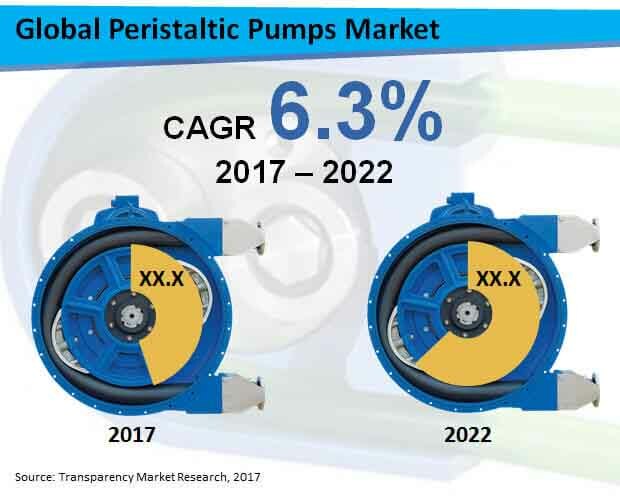 The global peristaltic pumps market is witnessing a heating competition owing to the increased investment in the research and development of new technologies, especially for high-pressure applications, thereby reducing downtime and providing safety. Increasing number of wastewater treatment facilities around the world are replacing diaphragm pumps with new peristaltic pump technology with metering pump technology. Increasing number of manufacturers are also moving towards developing smart peristaltic pumps that use sensors to allow users to remotely control the settings. The report also provides a detailed profile of some of the leading players in the global peristaltic pumps market such as Graco, Inc., Watson Marlow Limited, Cole-Parmer Instrument Company Limited, Wanner Engineering, Inc., PCM Group UK Ltd, Seko Spa, Verder Holding B.V, ProMinent GmbH, Albin Pump AB, and Flowrox, Inc. These key market players are entering into partnerships, mergers & acquisitions, and are also investing in the research and development to offer a better product with advanced features. The report by Transparency Market Research (TMR) expects the global peristaltic pumps market to witness strong growth during the forecast period of 2017-2022. The market is estimated to register 6.3% CAGR during 2017-2022. It is also projected to reach US$ 638.3 million revenue by the end of 2022. On the basis of product type, the market is segmented into variable speed pumps and fixed speed pumps. Among these, fixed speed pumps are expected to lead the global peristaltic pumps during the forecast period. By discharge capacity, 30-50 psig peristaltic pumps are likely to dominate the market throughout the forecast period. By end-use sector, water and wastewater treatment sector is expected to witness significant growth in the global peristaltic pumps market. The key regions covered by the report in the global market for peristaltic pumps are North America, Latin America, Europe, APEJ, Japan, and MEA. Among these regions, APEJ is expected to remain dominant in the global peristaltic pumps market between 2017 and 2022. Witnessing a strong growth, APEJ peristaltic pumps market is projected to surpass US$ 200 million revenue by 2022 end. There has been a rise in the replacement of submersible pumps and diaphragm pumps with peristaltic pumps. Owing to the various advantages offered by peristaltic pumps such as low cost of maintenance, eliminating the need for valves to work constantly at different pressures, without affecting the flow rate. Moreover, these pipes can pump liquids as well as gases. Hence, various industries including medical and biotechnology, water and wastewater treatment, oil and gas, and industrial process have started using peristaltic pumps to ease the operations and reduce maintenance cost. Wastewater treatment is an essential step in protecting the environment. For this, a biological treatment including the use of lime chemicals mixed with water to produce a slurry which is then added to the wastewater to remove any organic elements is being used. Progressing cavity pumps were used for lime dosing treatment, however, recently, the use of peristaltic pumps has increased. Expensive maintenance, leakage and component failure are some of the biggest reasons for the increase in the use of peristaltic pumps for lime dosing in wastewater treatment. Lime dosing being a critical element in the wastewater treatment, increasing number of water treatment plants a switching to peristaltic pumps for hassle-free operations.